The recent incident around Banksy embedding a shredder into the frame of his Girl With A Balloon has caught the world’s attention. As a nerd obsessed with the intersection of art and tech, I too was sucked in over the weekend in trying to unravel the mysteries behind Banksy’s self-shredding painting. I believe I bring a unique perspective to the mystery. I spent five years of my life working alongside expert scientists and engineers investigating mechanical device failures and patent-infringement cases. My job was to create demonstrative evidence in the form of hundreds of courtroom exhibits. Additionally, I come from a family with varied engineering and science backgrounds: my younger brother Matt (a computer scientist), my older brother Brian (an embedded systems engineer), and my father (who designed battery-operated implantable medical devices for several decades). I reached out to them for some assistance. In this post, we look at the key questions and offer up some likely answers (from an art nerd perspective). I also evaluate what this event says about Banksy and Sotheby’s moving forward. Could a device that had been in the frame for up to 10 years have the battery life to listen for a remote trigger? Was there a functional shredder in the frame or was a pre-shredded work spooled out? Was the shredder shown in Banksy’s video the device used to shred the painting? We will then follow up with questions around the potential for collusion between Sotheby’s and Banksy and what each scenario implies. Was Sotheby’s aware of the prank, and perhaps complicit? What does it say about Banksy if he colluded with Sotheby’s? What does it say about Sotheby’s if they did not know ahead of time? The question that came up the most often is, “How could the battery stay charged in the frame long enough?” This question applies both to the shredder and for the the remote triggering device. We're getting 10 years of standby life from our cameras on 2 AA batteries. They are contacting a base station for instructions a couple times a second and will run for 10 years if no video is taken. I'm amazed at how little power is used by the wireless processors I'm working on now. Brian also pointed me to an article on Hackaday which agrees with us that a “‘prime’ battery (that is, a non-rechargeable battery) could last long enough to be able to trigger and shred the painting. I think we can say the myth of a battery not being able to last long enough is BUSTED. For the sake of argument, here are two other plausible theories that have also surfaced that also seem like reasonable ways to do this without alerting Sotheby’s. First, Banksy’s authentication board ”Pest Control” reportedly had access to the frame ahead of the auction and could have swapped out the batteries. Second, they could have hidden a manual switch in the frame to activate the battery (unused up to that point) at the auction. 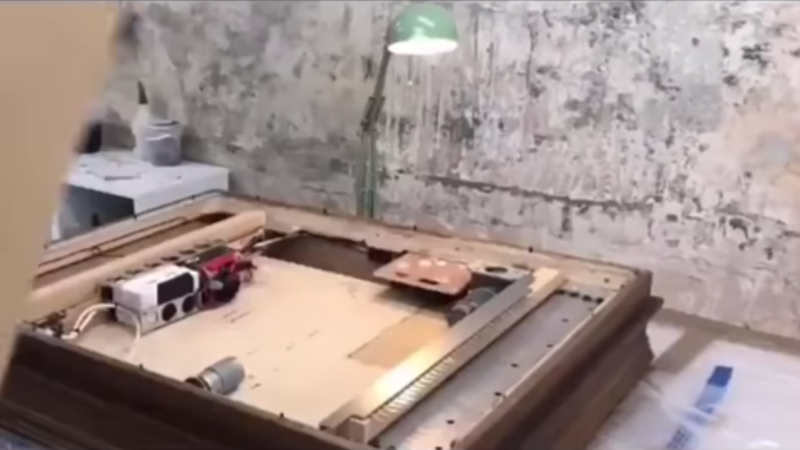 #2 IS THERE A FUNCTIONAL SHREDDER IN THE FRAME OR JUST A SPOOL? 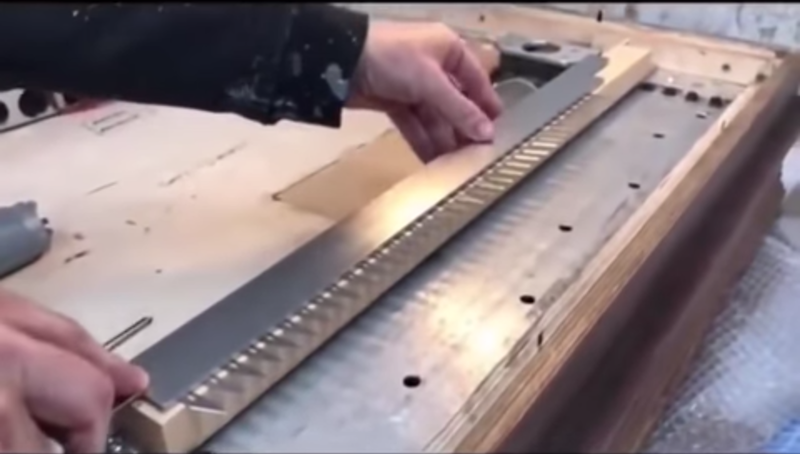 The device in Banksy’s video shows roughly 38 Exacto® blades lined up inside the frame. While this looks badass, it does not look anything like the mechanism inside of a traditional shredder. A traditional shredder uses two rollers with interwoven blades: very different-looking from Banksy’s device. Of course, there is more than one way to shred a painting… but surely Banksy would search for a DIY tutorial first? I did a search and there are some great DIY tutorials, but none that look anything like Banksy’s Exacto® approach. So now we are to believe that Banksy opted out of using an existing approach (despite there being many available) and instead chose to design something from scratch? Okay, strange, but I’ll buy it. But how likely is it that 38 X-Acto® blades would perfectly shred a large painting with zero tears or rips? I’m not sold, and would consider this myth busted had I not gone through the trouble of counting both the number of blades and the number of shreds. I come up with 38 for both. While I may not have arrived at the exact right number (the images were grainy), they feel like too good of a match to have been an accident. So how did these static blades make such a clean cut? I think the curl at the bottom of the painting explains this. The curl would suggest it had been spooled up on a roller for quite some time. Some have suggested that a second shredded painting was spooled out and the first one is still intact in the frame. This seems unlikely to me, as one would only need to open up the frame to be rewarded with a second artwork. If you look there's a good six inches of white canvas below the image. The section was already shredded and behind the frame... then using the same principle as scissors through wrapping canvas, it dragged the remainder through... the blades were already embedded in the canvas. It is way easier to continue a cut than make a fresh one. This also explains the angle of the razors. Sliding canvas across angled razors would be cleaner if precuts were made. A lot of people that read the original version of this article pushed back hard on the orientation of the X-Acto® knives. To help alleviate these questions, we have added the video below showing a razor blade cutting treated canvas like butter. MYTH BUSTED. Something to consider... if it was pre-shredded, than the canvas would have little to no rigidity... so no way it could push through anything. So either an opening that had to be visible or there's a motorized opening that was triggered. I don't see evidence of a motorized opening. This is a great point, and one we will revisit when we question whether or not Sotheby’s was in on the gag. So our conclusion for the engineering questions? Let’s now look at whether or not Sotheby’s was involved, and if so, just how much detail they likely knew about ahead of time. Now that we agree that the frame did shred the painting during the auction using the device shown in the video Banksy released, we can look at what the likelihood is that Sotheby’s was involved in the prank, and if so, to what degree. There were 67 lots in this auction, and the Banksy piece was the very last piece auctioned off. Had the Banksy piece been auctioned, say, 10th or 30th, the distraction from the beeper and the self-destructing work would certainly have interrupted the sales of many of the many other works sold that day. 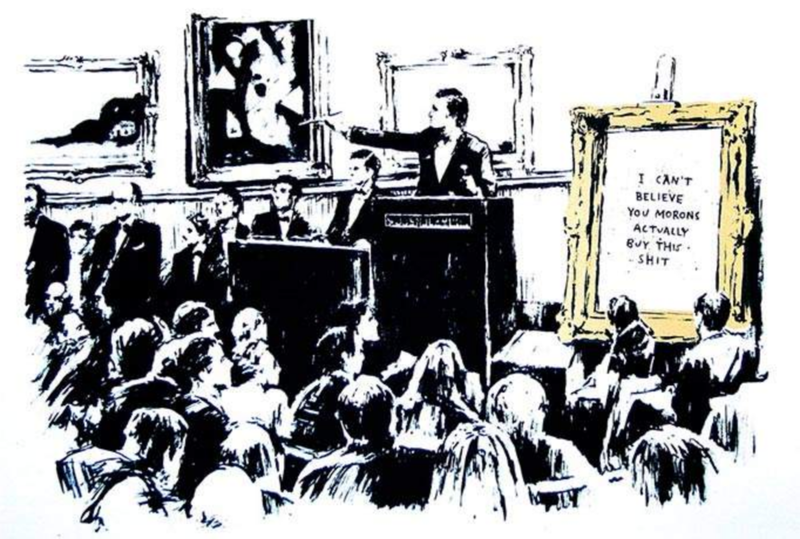 Sotheby’s reputation, their ROI, as well as the ROI for consigners, required that the Banksy piece be sold last. How likely is it that the Banksy piece went last by sheer luck? To put this into perspective, there are 38 numbered spots (1 through 36, plus zero and double zero) on a roulette wheel. If you put $1k on the highest number, 36, and it comes up, you win $35k. If that were easy to do, we’d all be retired. Now imagine the board has 67 squares (one for each lot in the Sotheby’s auction). The odds are almost twice as bad that your number comes up. In short, the sequencing of the sale was very likely no accident. I believe Sotheby’s intentionally put the Banksy piece last. Didn’t Sotheby’s inspect the work? Many people (including me) have a very hard time understanding how Sotheby’s experts could have examined the work without having noticed anything unusual. The frame is enormous relative to the painting, and many other versions of this same work have been sold without cartoonishly large frames. Wouldn’t one of Sotheby’s experts ask questions about this? Sotheby’s did notice the frame and asked to remove the work from it. Pest Control said that the frame was integral to the work and removing it was not an option. Maneker wrote that Sotheby’s often receives works with “artists frames” with instruction that the work and the frame must stay intact. Sotheby’s commented that they had assumed the gaudy frame was just one more attempt by Banksy to poke fun at the establishment. But what about the slot at the bottom where the painting was spooled out? There is no evidence in the video of a trap door, and as my brother Matt pointed out, the shreds would lack the structural integrity to be pushed out a paper-thin slot. Wouldn’t the slot have been rather large and rather obvious to the experts at Sotheby’s inspecting the work? And then there is the weight of the frame. This thing must have been super heavy with batteries and sheet metal inside, even for its enormous size… yet somehow it made it through inspection? I believe that while Sotheby’s was likely not fully aware of what was going to happen, they had a suspicion that something was up and played along for the sake of theater. To minimize the disruption, they put the Banksy work last, but until the shredded work scrolled out the bottom of the frame, the exact nature of the prank was not clear to them. I suspect that Sotheby’s knowledge was limited to knowing something harmless was up that potentially could benefit them as a PR stunt. It would be analogous to Banksy holding a giant sign with tape on it and Sotheby’s noticing this and graciously winking and turning around so it could be placed on their back. Sotheby’s then acted surprised when others pointed out that the sign read “kick me” and claimed to have been “Banksy’d” and then soaked up the press. If Sotheby’s had been complicit in planning the act, it would be pretty damaging for Banksy. There is nothing less cool than being a sock puppet for the industry you are claiming to rebel against. As it is, the shredding immediately drove up the value of Banksy’s work, which makes many wonder what his true motivations are. I believe Banksy’s people (Pest Control) let Sotheby’s know something was up but saved the details for the great reveal. Score one for Banksy, though there are many other ways he could have protested if they wanted to make the point without benefiting financially from the protest. Time will tell, but this appears to be a “lose, lose” scenario for Sotheby’s. If they were complicit in staging this, they have effectively turned one of the most prestigious auction houses into a bad episode of Storage Hunters. They lose credibility in an industry where credibility is all that matters. If they were not complicit, they look disorganized, unprofessional, and gullible, at best. Banksy has a 1 in 42 chance of getting the last lot. The first 25 were a single owner sale. He would not have been in the first dozen lots for a variety of reasons. So now 1 in 30 possibly fewer. Not clear the lot had to be last to pull the prank. Would have been better there in the middle of the room held by two porters. Sotheby's knew the frame was overly large and requested to open it which was refused by Pest Control. I can guarantee you that they weren't in on it. They had no idea. The head of sale put it last bc the consignors would not sell unless it was in the evening sale. The consignor is Banksy. The person who acted as a beard insisted on evening sale. He gave it to him but he was annoyed so put it last. There is no other possible consignor. As always, thanks for reading and feel free to reach out with ideas at jason@artnome.com. If you enjoy the articles be sure to sign up for the Artnome newsletter below.